The lobby features a 140-foot digital mosaic that rotates through different images. The Museum of the Bible is located near the National Mall in Washington, D.C. 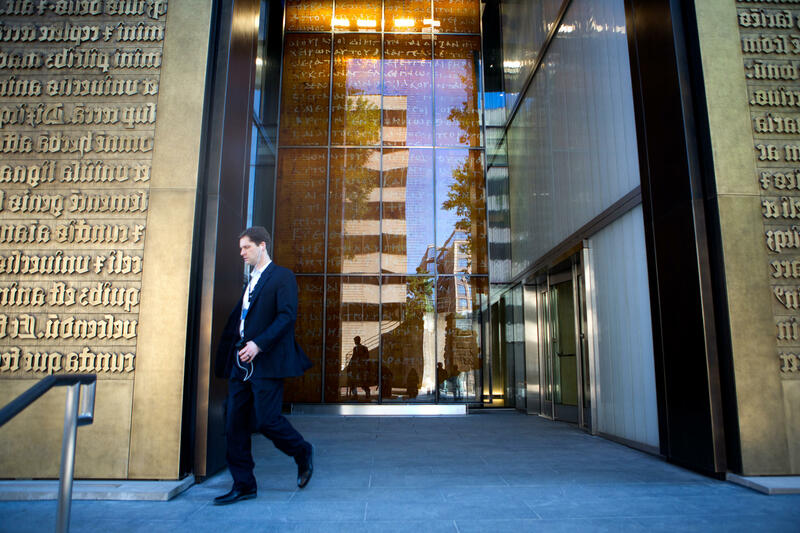 The entrance is flanked by large bronze doors re-creating the first page of the Book of Genesis. "We try to create the contextual setting," says Cary Summers, the Museum of the Bible's president. "We want to say, 'Here's what it looked like; here's how it felt to be there.' 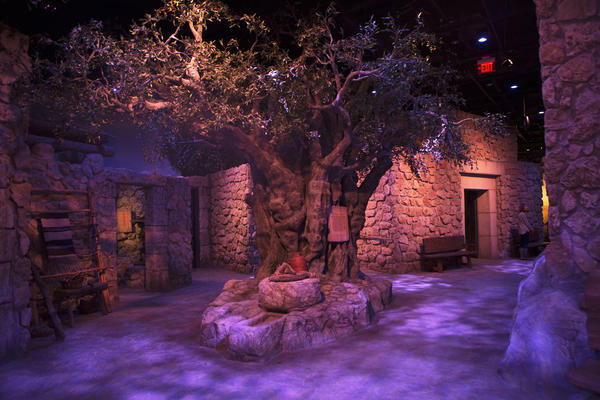 "
Limestone dwellings and olive trees make up a scene representing Nazareth during Jesus' time. 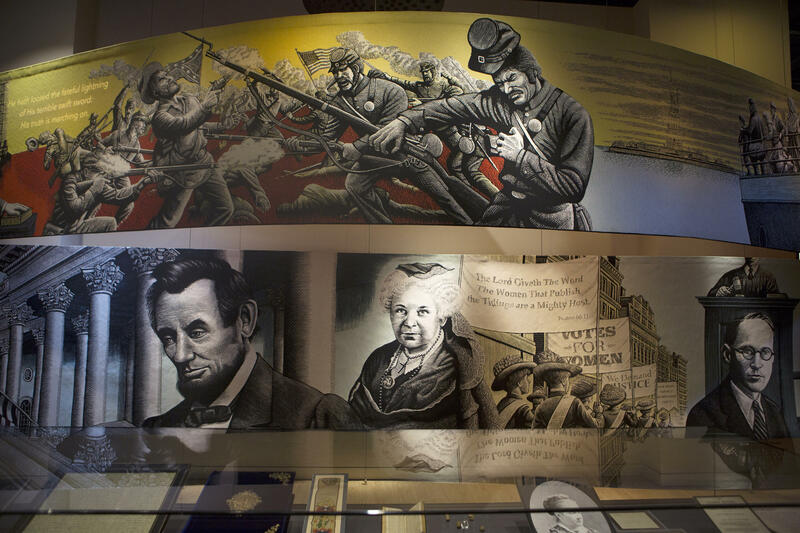 The museum features exhibits on the history of the Bible and its impact today. Beneath a mid-19th century painting, the museum displays manuscripts from early American writers, highlighting their Scriptural references. The museum displays the known translations of the Bible. 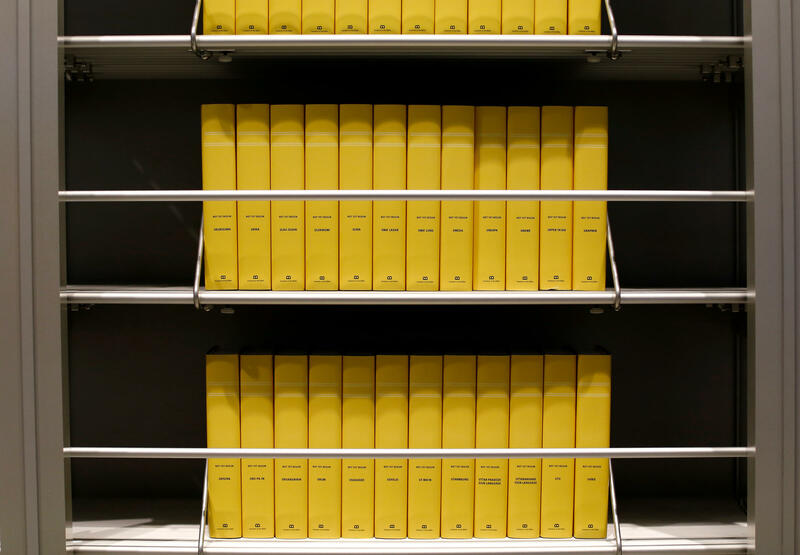 The yellow boxes represent those languages in which no Bible translation is available. This exhibit depicts the Bible's influence on American history. Summers and other museum officials insist the institution has no sectarian or evangelical agenda, even though the museum is largely the brainchild of Steve Green, the CEO of Hobby Lobby — the family-owned craft store chain known for supporting conservative Christian causes. The museum is housed in a former refrigerated warehouse a few blocks from the National Mall. It incorporates 430,000 square feet of interactive and high-tech exhibits, some of them with experiential features that rival those of a theme park. Visitors can tour the museum with the help of programmable electronic guides. Users can specify which topics or periods interest them and how much time they can spend in the museum, and the device will suggest a particular tour. It will track the users' location, describe what they're seeing, and even urge visitors to speed up if they begin to dawdle. In the section of the museum focusing on the New Testament, visitors see a re-creation of the village of Nazareth, where the Bible says Jesus was raised, made to appear as it existed in the first century. Dozens of scholars and archaeologists from both the United States and Israel provided expert input on the design of the exhibit. The dwellings are made of Palestinian limestone, and the olive trees in the gardens match those that flourished in Jesus' time. A soundtrack of chirping birds and braying donkeys runs in the background; the sounds were actually recorded in current-day Nazareth. Museum docents in period dress will explain how the parables found in the Bible drew on the daily life experiences of the people to whom Jesus preached. "We try to create the contextual setting," Summers says. "We want to say, 'Here's what it looked like; here's how it felt to be there.' "
Though the founders and many staff members of the museum are evangelical Christians, the designers have taken pains not to favor their own interpretation of the Bible or that of any other faith tradition. "There's not just one Bible, says Seth Pollinger, the museum's director of content. "We lay out 11 traditions or claims." "We can say, 'the Bible,' but we have realized this is at times offensive to Jewish audiences," Pollinger says. "They say, 'You're speaking from a Christian perspective. You're including the New Testament, but we don't.' So we're working hard to find ways to nuance it. We don't feel a need to steer people to 'The Answer' or 'The Bible.' "
Visitors learn about the development of the Hebrew Bible, known as the Old Testament to Christians, by walking through a richly detailed exhibit that begins with the story of Abraham and ends with the Book of Ruth. That section includes many ancient artifacts and manuscripts, some acquired by the Green family over many years of collecting and some on loan from the Israel Antiquities Authority. Other exhibits have come from the Vatican's collection, along with dozens of other museums around the world. The museum directors have contracted with scholars and experts from a wide variety of fields, and they have funded archaeological research and other investigations in several institutions. 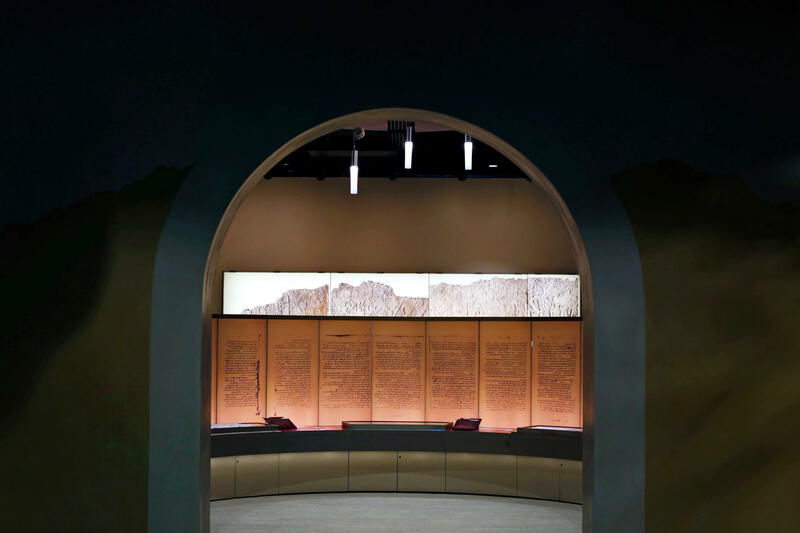 Despite these efforts to show institutional independence, the Museum of the Bible has encountered skepticism from some scholars and other critics. Much of it has focused on the role the Green family has played in the funding and development of the museum. Through Hobby Lobby Inc., its privately owned company, the billionaire family has amassed a private collection of about 40,000 artifacts and manuscripts from biblical lands, and the museum has drawn heavily on the Green collection in its own displays. Many of the materials acquired by the Greens were purchased privately on the global antiquities market, which routinely includes items that have been looted or forged. Hundreds of thousands of items, for example, have been looted from Iraq in recent years and made their way to the global market. Earlier this year, Hobby Lobby agreed to pay a $3 million fine and forfeit a collection of smuggled Iraqi cuneiform tablets and clay seals that the U.S. government considered forgeries. "It's the museum's responsibility to ensure that [the authenticity of] what they put on display is adequately represented," says Morag Kersel, an anthropology professor at DePaul University who specializes in the antiquities market. "At least they need to tell the story, so that people who visit can make up their own minds whether the artifacts are real." The Museum of the Bible is a legally separate entity from the craft store chain, and museum officials insist that their standards for acquiring items are just as strict as any other institution's. "People confuse the Hobby Lobby collection with ours," says Summers. "We scrutinize every item that we take in, to make sure it meets all the standards." Critics have also suspected the museum has an implicit evangelical Christian agenda reflective of the Greens' own perspective. The family is known for having convinced the Supreme Court that the contraceptive mandate of the Affordable Care Act, as applied to Hobby Lobby, violated their right to uphold their religious beliefs. "I would say the Green family has been more successful at impacting religion in the public square here in America than any other recent group," says Candida Moss, co-author of Bible Nation: The United States of Hobby Lobby, a book about the family's efforts to promote conservative Christian causes. "Think of their lawsuit. They tried to put a Bible curriculum in public schools. So I would not underestimate the impact of this museum on people who come to visit it." Steve Green was unavailable for comment. "They never tried to impose their point of view, which is an evangelical point of view, on this museum, ever," Summers insists. To allege otherwise, he says, is "blatantly not true." Summers does acknowledge that the museum's board members, including Steve Green, the chairman, have all been asked to sign a statement of faith regarding the truth of the Bible. "You want a common language," Summers says. "We take it as [a statement of] Judeo-Christian principles. We're going to operate by the Bible. We believe in the Bible." The museum directors say they have made a determined effort to keep their own religious convictions separate from the design of the museum. "We just talk about the Bible itself," Summers says. "We don't say it's 'inspired' or go down that road. We're just going to present it. We're not putting a spin on it." The museum clearly does have a viewpoint of its own, most evident in its discussion of the historical importance of the Bible and its impact in the world. 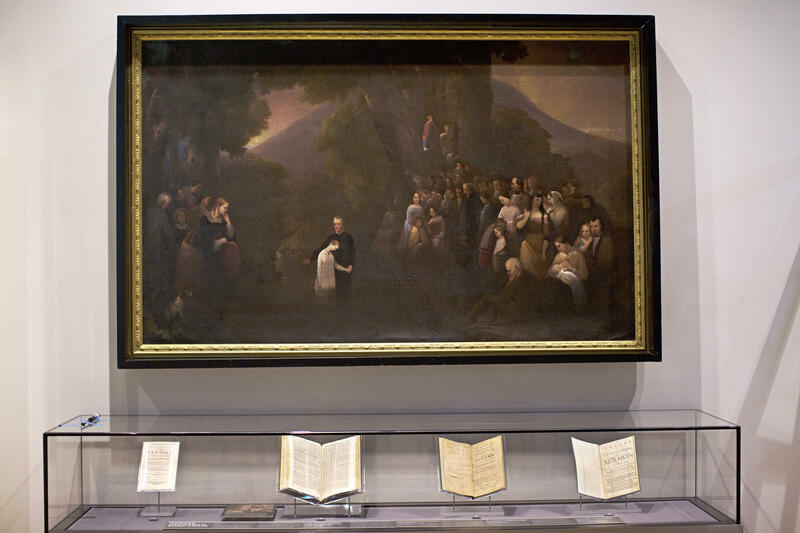 One exhibit focuses on the Bible's influence on America's founders. Display cases include examples of early Colonial writing, highlighting the Scriptural references. A placard next to the cases says the Bible "has had a profound impact on American history, culture, and politics" and "helped inspire the country's ideas about democracy." A subject that gets scant attention at the museum is the impact of the Bible on the development of Islam. Muslims recognize Abraham and other biblical figures as prophets in their faith tradition, just as Jews and Christians do. "We have worked on a few connecting points [to Islam] that we recognize as important," Pollinger says, "and I think we'll expand more and more. We will have discussions with Muslim leaders to have more understanding of these points of contact." On the eve of the museum's opening, its directors are confident that visitors will appreciate an institution devoted exclusively to the story of the best-selling book in the history of the world. 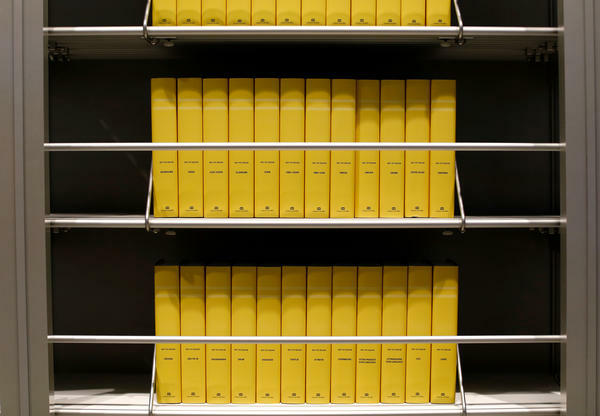 The newest museum in Washington D.C. is dedicated to a single book. The Museum of the Bible opens next week. It's a $500 million project privately funded. It puts interactive exhibits next to artifacts and manuscripts. NPR's Tom Gjelten reports the museum rivals a theme park in design. 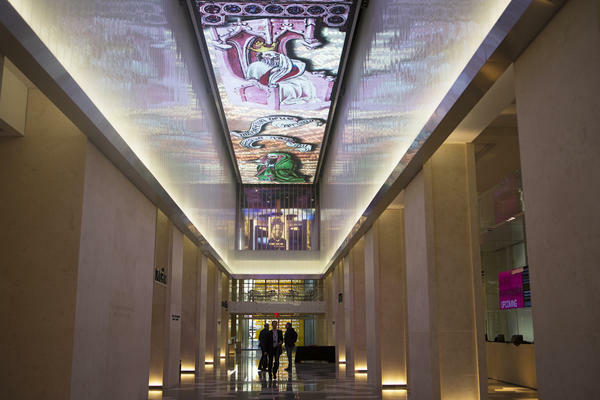 TOM GJELTEN, BYLINE: The museum founders and designers want visitors to feel the story of the Bible - where it was written, what was going on when it was written. CARY SUMMERS: This is Nazareth. GJELTEN: Cary Summers, the museum president, shows us a recreation of the village of Nazareth as it was in the time of Jesus. SUMMERS: This is where Jesus was raised. You know, he was born in Bethlehem, based the first few years in Egypt. The family comes back. They settle in Nazareth. GJELTEN: The dwellings are of limestone that actually came from Nazareth. There are gardens with olive trees and birds. The sounds were actually recorded in Nazareth, so you feel like you're right back there alongside Jesus and his disciples. SUMMERS: I mean, there was animals. And it was donkeys and hammering and - these were rugged guys - I mean, this - wow. And so that's what this really more represents. GJELTEN: Museum guides dressed in clothing from that time will explain how Jesus conveyed lessons through the use of parables. This experiential approach will be seen throughout the museum. 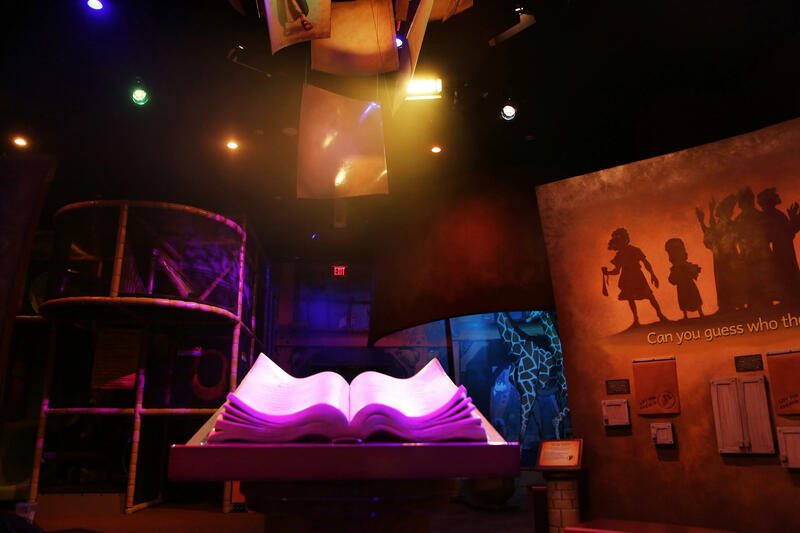 Visitors will learn about the development of the Hebrew Bible, the Old Testament, by walking through an exhibit that begins with Abraham and ends with the Book of Ruth. 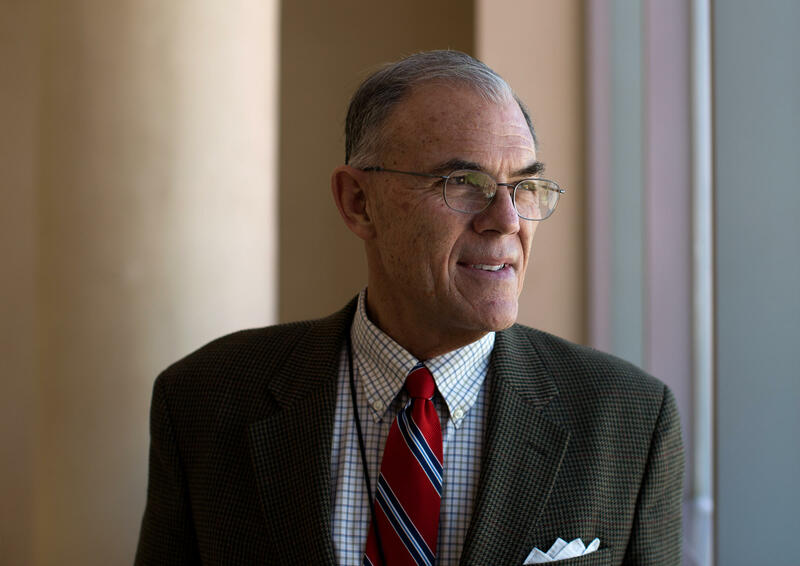 Summers says the mission is to acquaint visitors with the story of the Bible, not turn them into believers, not even to convince them the Bible is the word of God. SUMMERS: We don't use the word that it's inspired. We don't go down that road. We're just trying to present it, just talking about the Bible itself. GJELTEN: The museum does have a point of view, as seen in its description of the Bible's impact here in the United States. SUMMERS: How did the Bible influence the founding of America and the functioning of America? Let's go in. We'll take a look. GJELTEN: Glass cases here hold a variety of early colonial writings with Scripture references and the historic Bibles that inspired them. SUMMERS: So we start with some of the earliest, you know, items - the 1614 King James, the Geneva Bible, which was really the base of most translations in America. GJELTEN: The Museum of the Bible was largely funded by a billionaire Christian family, the Greens, founders and private owners of the Hobby Lobby chain of arts-and-crafts stores. This is the family that went to the Supreme Court to challenge on religious grounds the Obamacare contraceptive mandate. CANDIDA MOSS: I would say that the Green family has been more successful at impacting religion in the public square here in America than really any other recent group. GJELTEN: Candida Moss is the author of a new book, "Bible Nation: The United States Of Hobby Lobby." She worries the Green family connection means the museum has an evangelical agenda. MOSS: They did try to put a Bible curriculum in public schools, and so I wouldn't want to underestimate the impact of this museum on people who come to visit it. GJELTEN: In truth, the museum directors make no secret of their Christian convictions. Cary Summers acknowledges that board members have been asked to sign a statement of faith. SUMMERS: I mean, it's just a commonality there. We're going to operate by the Bible. We believe in the Bible. GJELTEN: But the museum says it's committed to a nonsectarian approach. Seth Pollinger, the museum's content director, says the Bible means different things in different faith traditions. SETH POLLINGER: We have already realized this is at times offensive to Jewish audiences that say, well, when you say the Bible speaking from a Christian perspective, you're including the New Testament. But we don't include it. And so we - you know, I think we're working hard to try to find ways to nuance it. We don't feel like we need to steer people to the answer, the Bible. GJELTEN: The museum has nonetheless provoked a buzz. Archaeologists have questioned the authenticity of some of the artifacts that came from Green family collections. In response, the museum has instituted measures to ensure all their items are legitimate. And the museum is getting praise for its efforts to educate people about what is still the best-selling book in the history of the world. Tom Gjelten, NPR News. (SOUNDBITE OF TOSCA'S "NATURAL HIGH") Transcript provided by NPR, Copyright NPR.